Myotherapy is the assessment, treatment and management of musculoskeletal dysfuction that can result from improper posture, trauma, overuse or incorrect biomechanics. Pain complaints can arise from different structures of the body such as muscle, tendons, ligaments or fascia. Using palpation skills a myotherapist can assist to treat and prevent soft tissue pain which can cause a deep aching sensation, reduced mobility and strength, stiffness or numbness in the body. Myotherapy is a very “hands on” therapy and employ various techniques in the management of your condition. Following the initial examination the therapist will outline a health plan and depending on your injury will utilise a number of modalities such as: trigger point therapy, dry needling, deep tissue massage, hot and cold therapies, passive/active muscle stretching, electro-mechanical stimulation and corrective or rehabilitative exercises. Following multiple sporting injuries at a young age, Kate was drawn to study in the health industry to help others reach and maintain their optimal functional levels. 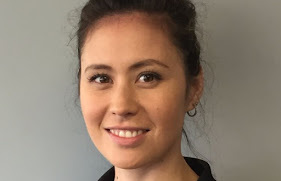 MyotherapyAfter graduating from Southern School of Natural Therapies with a degree in Myotherapy, Kate has been working for over nine years in a variety of clinical settings within Victoria. She has also had a lot of experience working as a football trainer and at sporting events such as triathlons and marathons. Kate has made the treatment of headaches, postural issues, back pain and pre and post natal health her specialities. Her friendly and approachable nature gives her a natural ability to empathise with patients of all ages. Kate also has a broad understanding and experience of trigger-point therapy, deep-tissue massage, dry needling, cupping, passive & active muscle stretching and myofascial release. She is passionate about achieving the best results for her patients so they can return quickly and confidently to work, sport & everyday life.